Samara Pepperell is proving to be an unstoppable force in social media and this talented artist has a lot more going on than most. Designing apparel and sporting equipment are just two of the things that are driving this Kiwi forward. You can find her under her nom de rous (name on wheels alter ego) Lady Trample showcasing her talents on quad skates in skate parks and derby tracks across the planet. That is when she isn’t too busy filling up your social media feeds with her awesomeness as a model and athlete. Samara is a member Team New Zealand Roller Derby and competed with the team in the 2014 Blood and Thunder World Cup. She is also an internationally sponsored athlete, advocate for youth in sport and crafting healthy body image for young girls, and finds time to run a start up at Chicks in Bowls with an impressive social media following. She manages to do all of this while being a highly sought after international coach in Roller Derby and Ramp Skating. Clearly she is a busy lady, but what makes her even more impressive is her age. At 24 Samara has already accomplished more than most of us will by the time we retire. She is also surprisingly insightful in regard to how it feels to fail and why failure is important in both sport and business. It’s so easy to give up before you even try. She quips while telling us why that having a safe place to fail can change how you approach problems. Failure is just a hiccup on the road…dust if off and get out there. 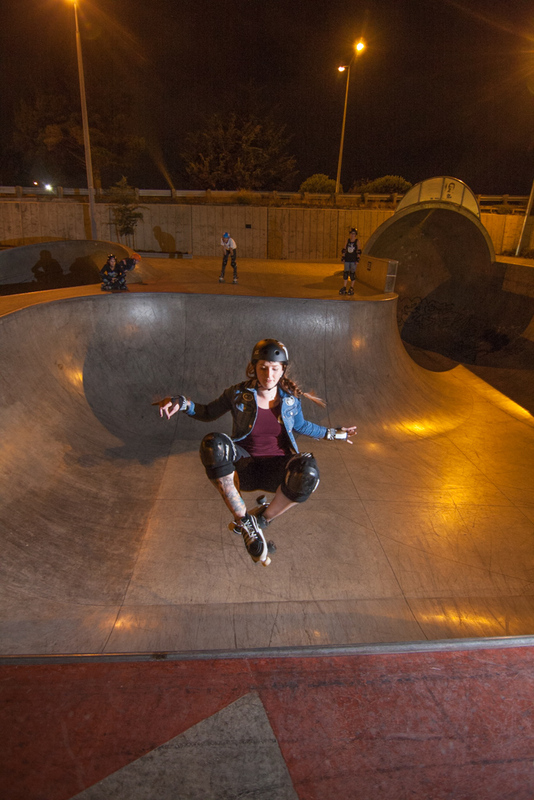 Her brand Chicks in Bowls has become synonymous with ramp skating and she discusses how important it has been to embrace the fear so you can look forward to the next hurdles you need to jump. Crediting her success as an athlete to her ability to surround herself with a fantastic skate team and business partnership she focuses on her desire to have them inspire each other to push boundaries in their individual performance. What is most surprising is her enthusiasm for getting more women and kids into skating in a healthy and inclusive community. She doesn’t stop at the healthy lifestyle element either. After facing years of eating disorders she has started to celebrate the fact that the thick thighs she used to be bothered by now power her ability to do more tricks on the ramps. This passion for healthy body image leads her to advocate for the #ThickThighsSaveLives movement focused on strong over skinny bodies for young girls. Her desire is for the brand to showcase strong, capable, women, men, and kids getting out of their comfort zones and we think she is an ideal poster girl for the movement. Clearly Samara Pepperell is proving that doing things #likeagirl can be #prettygnarly and inspiring! This post is the first in the Ground Breaker Series on Critically Drinking. You can also find a transcript of the podcast here.